After bringing 30,000 fans to Pioneer Square in each of its first two years, the startup festival backed by Paul Allen's Vulcan will not happen this year. After bringing tens of thousands of fans to Pioneer Square the last two years, Upstream Music Fest + Summit will not return in 2019. The Vulcan-backed festival announced Wednesday that it is “taking a break” this year, hinting at a possible return one day in some form or another. The upstart festival launched in 2017, amid an increasingly difficult market for music festivals, with the goal of spotlighting local and regional talent. Each year Upstream spread 200-plus acts across roughly 15 venues during three days of events around Pioneer Square. Spearheaded by the arts and entertainment division of Paul Allen’s Vulcan company, the idea of a tech-sponsored music fest was initially greeted with some mixed feelings among local artists at a time when many are struggling to deal with Seattle’s rising costs of living during the city’s tech boom. Regardless, Upstream wisely tapped respected local booker Meli Darby and credible local and regional guest curators well-versed in various scenes and genres for a more community-oriented approach to booking. According to an Upstream spokesperson, the decision to pull the plug was not affected by the death last October of Allen — an avid music lover who was spotted taking in at least one of the festival’s acts (Snarky Puppy pianist Bill Laurance) last year. Although Upstream reported attracting 30,000 people over the weekend last year — roughly the same amount as 2017 — the mainstage area was noticeably less crowded on Saturday and Sunday than it was for Miguel on opening night. While Year 2 lost some of the inaugural fest’s funkier, less-traditional venues — no more Smith Tower dance party or Nacho Picasso riling up fans in the low-ceilinged Galvanize Basement — it beefed up its mainstage acts a bit, with Miguel, the Flaming Lips and a recently reunited Jawbreaker. It’s been a rough couple of years for many festivals across the country and the Seattle area is no exception. After a welcomed return to indie form last year ultimately failed to get the struggling Sasquatch! Music Festival back on track, the long-running fest called it quits after 17 years. 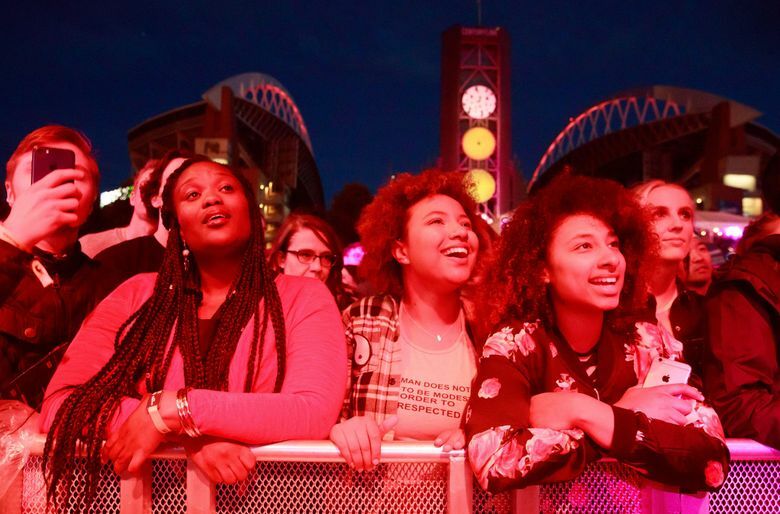 Attendance was also down at Bumbershoot last fall, the Stranger reported, after years of steadily climbing ticket prices.